There are two great pleasures after an exiting day outdoors. One of them is to have an exquisite meal. Almost all accommodations include breakfast with your choice of hearty cooked or continental breakfast (always check the characteristics of the menu at the selected accommodation). Talking about the common dish for breakfast is Gallo Pinto which consists of rice mixed with black beans, served with natilla (sour cream), eggs (scrambled) and fried plantain. Costa Ricans usually drink a cup of coffee or fresh fruit juice with it. 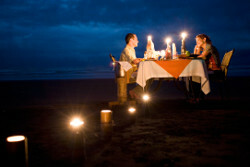 Lunches occur in a variety of enjoyable settings, which will depend on the activity selected for the day, for example a picnic feast on the beach, or a tropical fruit on the riverside. But if we talk about the traditional lunch its called Casado. This dish consists of rice and beans served side by side and not mixed with some sort of meat or fish and a salad, fried plantains, white cheese and corn tortilla. 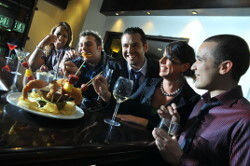 And dinner is considered the best opportunity to socialize while enjoying the ambiance of Costa Rica’s best restaurants. There is no typical meal for dinner, but another typical main dish in Costa Rica is arroz con pollo (rice with chicken) which can be served with different vegetables from the area like camote, chayote and yuca. Seafood is also common thanks to the country’s proximity to both the Pacific and Caribbean. Small dishes before or in between meals are called Bocas, like black bean dip, chimichurri (tomatoes and onions in lime juice) served with tortilla chips or ceviche (fish/ shrimp with onion in lime juice). Typical soups in Costa Rica are also very popular, such as Olla de Carne which is a soup with beef, potatoes, carrots, chayote, plantains and yucca, and the Sopa Negra black bean soup. There are a lot of traditional Costa Rican desserts like Arroz conLeche (rice with milk). The rice is cooked in milk with sugar, cinnamon and other ingredients. And one of the most common desserts is called Tres Leches, a cake bathed in evaporated, condensed and regular milk with a whipped cream top. All of the mentioned dishes will delight your palate!! !